Needless to say, my daughter was pleased. So was I, at least until the next year. Then it happened. That little boy cat had kittens. My wife had tried for months to convince me that this cat was a girl. I would not even look. There are just some things that you expect your doctor to know. When the cat started getting fat, I accused my wife of over feeding the cat. Never once did it occur to me to check the cat for myself. I just took someone else‘s word for it. We do that a lot these days. We hear rumors or gossip, and very often we will pass on these rumors and gossip without even checking their truth. We simply take the word of those we trust, and sometimes even those that we don‘t trust. We do it in our daily lives at home, work and even in church. It can be very dangerous to take the word of someone at face value. Sometimes we only hurt ourselves, but other times we hurt those around us. I am reminded of Luke 9:18-20. Jesus asked the disciples, ―Who do the people say that I am?‖ The disciples answered, ―John the Baptist; but others say, Elijah; and others, that one of the old prophets has risen.” It would have been a shame if the disciples had taken the rumors and the word of the people at face value for truth. Imagine what they would have missed. Peter looked deeper, and he sought for his own answer. When Jesus asked him what he thought, he said, ―The Christ of God.‖ The rest of the world failed to recognize Jesus, because they did not look for the truth. Many times we complicate our own lives, miss opportunities, and even bring hardships upon ourselves and those around us simply because we donut take the time to look for the truth in all matters. Life is hard enough as it is without us making it more difficult. For us to really know Christ and to effectively make Christ know we must seek the truth. 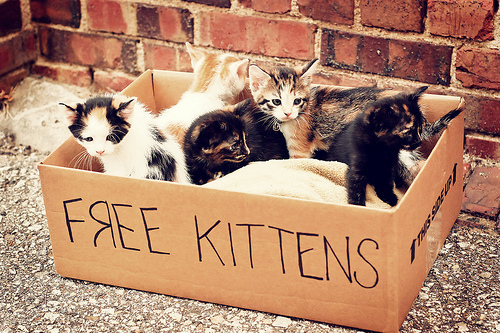 As for me, well if you know anyone who needs a kitten, send them my way.